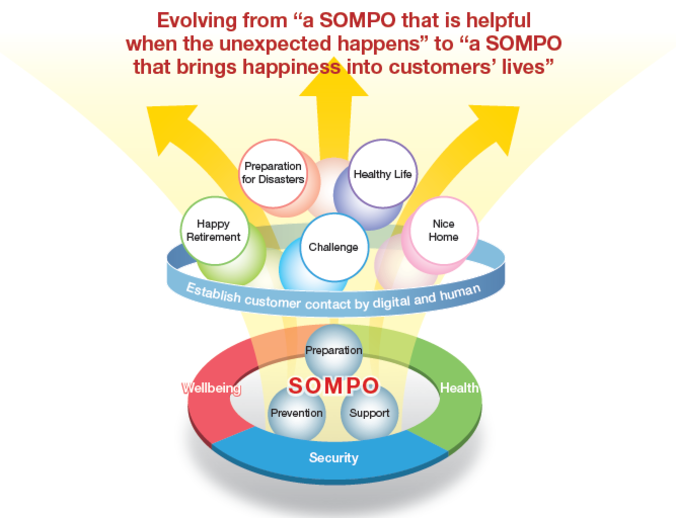 SOMPO Holdings will comprehensively support the security, health and wellbeing of customers across an expansive range of life stages and also in daily life. The goal is to evolve into “a theme park for the security, health and wellbeing of customers” that brings happiness into their lives. “Innovation for Wellbeing” has been adopted as the Group's brand slogan. Under this slogan, the Group has positioned insurance at the heart of its business model, even as it has advanced into a more expansive range of business domains such as the nursing care service and home remodeling business fields. Under the Mid-Term Management Plan, the Group will evolve and enhance its respective businesses and services in various fields so as to transform them into attractions with appealing features. This will be done by exploring new business opportunities, enhancing the quality of existing businesses, and expanding service domains along with fostering collaboration among businesses. In parallel, the Group will harness digital technologies to upgrade and expand its customer contact, in addition to providing services that are focused on customers through people.